On your arrival in Chennai, India you will be received by our representative who will assist you to your hotel and will also brief you about your tour. After handing over all the relevant documents and details of your tour, our assistant will leave you for a comfortable overnight Stay at hotel. Post breakfast, start your panoramic city tour with Fort St. George which was the first British outpost in India followed by a tour in the San Thome Church, Then drive to Marina Beach which is the longest natural urban beach of India. After spending some leisure hours here, proceed to Mahabalipuram and en-route explore the religious capital of South India i.e. Kanchipuram. The city is famous for its rich historical, religious and cultural background and has many beautifully sculpted temples. After exploring the city of Kanchipuram, continue your drive to Mahabalipuram. On arrival, check in to the hotel. And spend the rest of the time at your own leisure. An overnight stay will remain scheduled the hotel. After breakfast, start exploring the city that exhibits the best art and architecture of South India. Best known for its exotic shore temples, the city is also referred as an ‘open-air museum’ because of its artistic and sheer architectural designed temples and rock cut caves. Classified as the UNESCO’s world heritage site, the city is famous for its Chariot designed temples and cave sanctuaries that have monolithic architecture and monolithic sculpting engraved on it. An overnight stay will remain scheduled in the hotel. After taking a delectable breakfast in hotel at Mahabalipuram, proceed for your next destination, i.e. Pondicherry which was formerly a French Colony. Offering you the best of tranquil atmosphere, the city has an essence of the French-colonial era. The clean and quite shady cobbled street with logically arranged shops and structures stills reflects its strong French connection. On arrival, check in to the hotel and after taking a short break visit the world famous Sri Aurbindo Ashram which was founded by Sri Aurbindo in 1926 and is famous among spiritually headed people. Evenings are kept free to enjoy the peaceful beaches. An overnight stay will remain scheduled at the hotel. After breakfast proceed to Thanjavur, on the way visit beautiful Natraj Temple at Chidambaram. Dedicated to Lord Shiva, later continues to drive to Thanjavur. On arrival, check in to the hotel and after taking a short break to explore this city which treasures the Dravidian civilization in its religion, art, culture, architecture. Start your tour with Brihadeshwara Temple, which is famous for its sculpted granite rocks and the glorious Dravidian architecture and is also the UNESCO world heritage site, day free for your own individual activities and stay overnight in hotel. After taking breakfast, depart for your next destination i.e. Trichy. Situated on the bank of the Cauvery River, the fourth largest city of Tamil Nadu is also the commercial center of Tamil Nadu. On arrival, check in to the hotel and after taking a short break take a tour to the famous and India’s largest Sri Ranganathaswamy Temple, which is also said to be one of the Nava Graha Sthalas of India. Surrounded by 7 concentric walls, the temple has a deity of Lord Vishnu reclining on a serpent. Next, visit the Tiruchirappalli Rock fort, which is the most prominent landmark of the city. Situated on the bank of the Cauvery River, the temple comprises of 3 temples in all and offers a spectacular panoramic view of the city and the Ranganathaswamy Temple. Evenings are kept free and overnight stay will remain scheduled in the hotel. After taking breakfast, depart for Madurai. Situated on the banks of river Vigai, the city is said to be 2500 years old. Also, known as Athens of East, on arrival, check in to the hotel and after taking a brief break visit the Meenakshi Amma temple. Dedicated to goddess Parvathi, the temple beautifully craved 12 Gopurams out of which the 48.8 m high southern Gopurams has the most attracting sculptures craved on it. The opulent architecture and magnificent beauty of this place makes it a must visit place. Evenings are kept free or you can also visit the Thirumalai Nayak Palace and the Gandhi Museum to explore the rich culture and heritage of the city. Take an overnight stay in the hotel. After breakfast, depart for your next destination, i.e. Thekkady, which is located on the river side of Periyar. On arrival check in to the hotel after freshens up get ready to visit spice plantation of Thekkady. With cardamom, pepper, rubber, turmeric, vanilla, nutmeg, ginger, cloves, curry leaves, coffee etc; wander amidst of green farms to experience the real taste and smell of these spices. Evenings are kept free to enjoy the place at your own leisure and overnight stay will remain scheduled in the hotel. Early morning before breakfast; leave for a wildlife viewing to the sanctuary on Lake Periyar by boat cruise. Later return back to the hotel and have breakfast. Afternoon; drive down to Kumarakom. An unbelievably beautiful paradise of mangrove forests, emerald green paddy fields and coconut groves interspersed with enchanting waterways and canals adorned with white lilies. Kumarakom is surely a beautiful small water world, situated on the banks of the Vembanda Lake. On arrival, check in at the backwater side resort and rest of the time leisure at hotel, stay overnight at hotel. Post breakfast; visit Kumarakom bird sanctuary to explore the variety and flocks of many local and migrant birds. Offering a delightful treat to your eyes, this place is a best visited while cruising a boat and is a must visit for those who want to experience the beauty of nature in their beautiful creatures. An overnight stay will be at hotel. After taking breakfast, depart for your next destination i.e. Alleppey. Best known for the palm fringed canals, picturesque lakesides and the mirror still lagoons, the peace and tranquility of this place can be best experienced with an overnight house boat journey. So, on arrival in Alleppey, board a traditional houseboat of Kerala, “Kettuvallam”, to explore and experience the backwater lifestyle of Kerala. Take on overnight stay on the houseboat itself to witness the breathtaking panoramic views of nature’s beauty at its best. After breakfast leave for Cochin and on arrival check in to the hotel. Here, after taking a short break, begin your tour to Cochin. Starting with the India’s oldest Synagogue, we will further take a tour to the Dutch Palace and the oldest European Church in India – the St. Francis Church where Vasco De Gama was originally buried. Later in the evening, take a leisure walk through the Fort Cochin area to witness the vivacious European architecture and the vast and giant fixed Chinese fishing nets which are still being used for fishing purpose in the coastline line. After taking up a chaotic tour of the city, take an overnight stay in the hotel. Post breakfast, transfer to Cochin airport to board a flight for Bangalore. On arrival drive to Mysore enroute visit Srirangapatnam, a small river island situated amidst of the river Cauvery. The place is best known for the Ranganathaswamy Temple and Tippu’s Sultan summer Palace. After taking a brief tour to Sri Ranganathaswamy Temple, continue your journey to Mysore. On arrival to the city, check into the hotel and stay overnight. 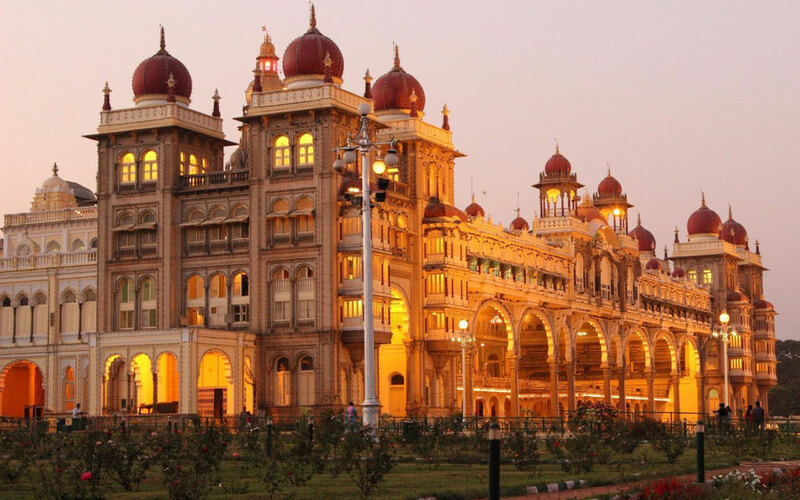 After taking breakfast, start your tour with Mysore Palace with the Indo-Saracenic architecture is the main tourist attraction point here. From here, visit the Jaganmohan Palace Art Gallery which is famous for its beautiful collection of unique and antique art pieces. Next, take a tour to St. Philomena’s Church. In the evening you may visit Brindavan Garden and the adjoining Krishna Raja Sagar Dam where musical fountains and colored lights transform this place into a magical fairyland. Overnight stay will remain scheduled at hotel. Post breakfast transfer to Bangalore international Airport, We are affirm to make your every travel package, the best one so that you can take back home a plentiful of illustrious memories of a fabulous India Tour.